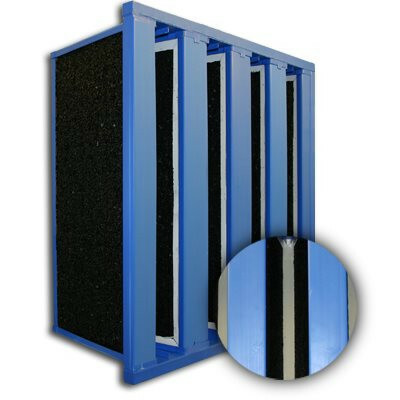 24x24x12 SureSorb Bonded Carbon Panel V-Cell with Header | Air Filters, Inc.
Air Filters, Inc.™ SureSorb™ bonded carbon V-Cell filters efficiently remove Volatile Organic Compounds (VOC’s) and odors. These low dust panels are ideal for improving Indoor air quality as well as saving time in change out time versus refillable cells. Lower pressure drop values save energy and provide lower pressure drops than typical packed trays. Just dispose of the panel through incineration or normal disposal depending on the VOC's captured in your carbon. These filters are highly effective for removing VOCs and controlling odors and can be applied as an excellent pre-filter for use in commercial and industrial high efficiency systems. Astro-Pleat™ SureSorb™ bonded Panel manufactured advanced bonding technologies, our bonded media disposable panel filters offer a unique approach to VOC and odor removal. By design, the bonded media disposable panel offers an environmentally responsible, effective and affordable solution. Additionally, the panels are completely disposable, simply remove and replace. Designed to be used in existing housings, the panels require no system modifications.